1. Put all the hair in a ponytail. Where you put it will decide whether you can see it from the front or not! 2. Roll the hair of the ponytail so it will be easy to pull through the ponytail. 3. Loosen up the ponytail a bit and make a little hole with two fingers. 4. Pull the hair through the “hole”. 5. Take the ends of the ponytail and pull through the loop you made from the ponytail and around the base of the ponytail. 7. 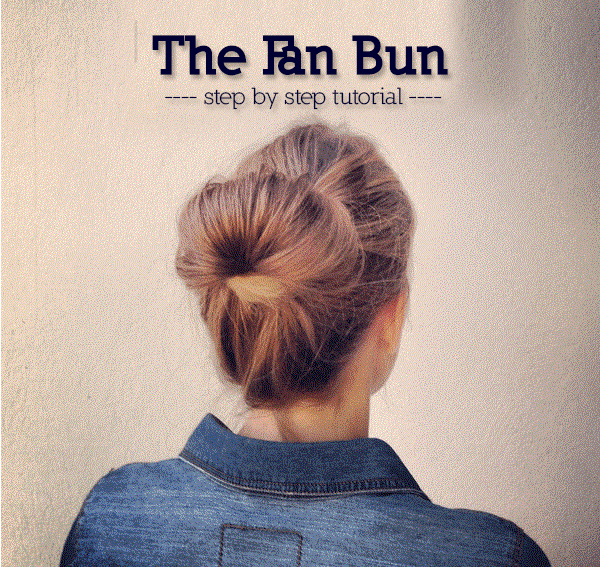 Pull down the sides of the bun to create the fan and secure with bobby pins. 8. Secure the bun to the head. This step is optional depending on where you put the bun.